Of all destinations in Southern California, Lake Cuyamaca State Park is far and away our favorite. The combination of the beautiful mountain scenery, the water falls at Green Valley, the miles upon miles of hiking trails, and the proximity to the iconic town of Julian all combine to make Cuyamaca one of the best all around weekend destinations. Only an hour away from San Diego and two hours away from Orange County, you owe it to yourself to make the trip to enjoy the park. This post is about our experience at Green Vally Campground, the smaller and southernmost of the two campgrounds within the park, and was most recently updated after our last visit in October, 2016. You can read about the larger campsite, Piso Picacho, here. The Green Valley campground is mainly popular for the creek and water falls within the campsite, but the camping itself can’t be overlooked. There are 81 campsites, almost all shaded by big beautiful oak trees and defined by granite boulders. The terrain and trees do give a sense of privacy to most of the sites – I think compared to most other campsites Green Valley can be considered to be very separated. Our site on our first trip, #61, is a prime example of this, as we were surrounded on all sides by trees and were never bothered, and our site when we last visited, #52, was just as rad (see pictures below). Green Valley is open on the reservation system from spring to fall. Each campsite is equipped with a picnic table and fire ring, although for you RV folks there are no sites with hookups. Any additional vehicles above the included one car are $8 apiece, with a usual limit of no more than 3 cars per campsite. Also, there is a limit of 8 people per campsite. Your dog is welcomed, but are only permitted to hang around the campgrounds, picnic areas, and paved roads, and cannot be left unattended. There is a 14 day stay limit while in season (March-November), which expands to 30 days in the winter offseason. Seniors, you can get $2 off your campsite fee if you’re 62 and older, and 1/2 off with ADA (with vehicle placard or CA Parks ADA Access Card). Remember to check in if you come late! As with almost all sites, the gates reamin open after hours, you just have to make sure you come back in the morning to check in. Sites 1-15 are located in the equestrian campground. To reserve a spot in the Green Valley Family Horse Camp, call 1-800-444-7275. The Los Vaqueros Group Campground is open from May to November, and is $550 per night for up to 80 people. Green Valley also contains the trailhead to the Arroyo Seco Primitive Trail Camp, as well as the Arroyo Seco Picnic Area. 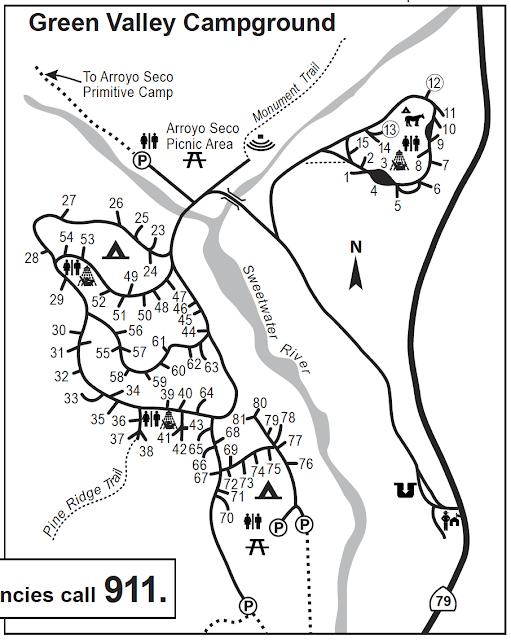 The Pine Ridge trailhead originates near sites 37 & 38, while the two day use parking areas used to access the Sweetwater River falls are located at the bottom of the campground. The campground sits at an altitude of about 4,000ft, so it does get chilly at night. Even in the first week of June, the temperature dipped to 40 degrees by 10pm at night, although the temperatures hovered in the mid-70’s during the day. In early October, it was similar, and we even got down to 38 degrees in the early morning. Sites include picnic tables and fire pits, and firewood is sold by the rangers and camp hosts at $8 per bundle (as of Oct. 2016 – prices are subject to change). At the end of the campsite is the day parking areas, from which a short hike down to the creek will bring you to the waterfalls. Although the water is always freezing (if I had to take a guess it was in the upper 40’s), the jumping opportunities more than make up for it. Make sure to take the fire road down from the parking lot, that will bring you to the better of the two swimming areas. The terrain is rough and the rocks are incredibly slippery when wet, and there is an abundance of poison oak, so be careful when swimming. It’s worth noting that your swimming experience will certainly differ based on when you visit. Although CA has been in the throes of an exceptional drought, there was still a small trickle of water in the creek in October, but it was certainly not even close enough to swim in. In years past, the spring was always the safest bet, as the creek would usually be full enough after the winter and spring rains. With the drought, all bets are off. The creek trail is still a beautiful hike, except for the disgusting new piece of graffiti at the swimming hole. We’d love to hear from any of you guys that visit Green Valley how the water was when you visited. Like we’ve mentioned, this campground is so great because of the diversity of great sites. There are sites that are particularly private, sites suited well for groups, sites with lots of shade, sites with lots of rocks…you name it. This is a traditional old campground, where not all of the tent pads or flat or driveways easily accessible, but it’s the incorporation of nature into its design that makes it one of a kind. The natural boulders and use of shade and hills provide both privacy and a uniqueness that not too many other places have, even more so than at Piso Picacho. The campsite is built into the side of the hill, with the sites terraced up the hillside away from the river. Some of the sites we really liked are 23 and 25 (both better RV spots than tent spots – flat and spacious), 27 (very private), and 29 (29 and 30 could also be nice for a group). 32 and 33 don’t have the cool rock formations, but both are private and spacious with lots of shade. 36, 37, 38 and 41, 42, 43 could be used together for a big group, but are probably not great individually (very little privacy). 47 and 48 are also a decent group pairing, as are 56 and 57. As seen in the photos above, both 52 and 61 are great. 64 looks to be very private and also very spacious.There aren’t too many spots I’d try to avoid, but I do think that the sites near the group area (70-76) are less ideal (closer to the water, but at the mercy of people in the day use area). 39 is a beautiful spot but it’s right next to one of the bathrooms and the camp hosts. Site 46 is small and has very little privacy. The sites that appear close to the creek (76-80) are nowhere even close – even when the creek might be flowing it’s not easy to get to and certainly not a great swimming area. Your camping reservation includes the ability to go anywhere in the park without paying a new day use fee, which comes in handy if you decide you want to go hiking. The best area to park is Paso Picacho Campground’s day-use area, which has access to two of the park’s main trails, the Stonewall Peak Trail, and the Cuyamaca Peak Fire Road, which climbs to the 6,512-foot summit of Cuyamca Peak. At the top, you’re treated to a spectacular view of the Pacific coastline, Colorado Desert, Mexico, and the Salton Sea, as well as Cuyamaca lake. The trail up was a paved fire road, but the going was still tough since we gained over 900 feet in elevation. Make sure to bring plenty of water, there is no water source on the trail. The summit provides a perfect opportunity for a picnic, although the exposed face may get quite windy at times. Cuyamaca Peak is not the only worthwhile hike in the park, although I would argue that it has the best view. There is over 100 miles of hiking throughout the park, including popular trails to Stonewall Peak, Oakzanita Peak, and various trail camps. Here is a list of the most popular suggested hikes, taken from the official Suggested Hikes brochure (in order of Easy to Difficult). Indian Trail –Easy (Suitable for Children) – A self guided nature hike. Level, wide trail following Cold Stream, 1 mile total. Trail Head/Parking– East side of bridge on the road to Camp Cuyamaca. Parking is available at the trail head for an $8 day use fee, or park at Dyer Parking, on Highway 79 at the Dyer Monument (no fee). Trail Head/Parking – Picnic Area parking lot in the Green Valley Campground, $8 day use fee, free parking if camping within the park. Azalea Glen Loop Trail – Easy – Views of open meadows and small stream near the Piso Picacho campground, with only one steep section. Opportunities for seasonal wildflowers and birdwatching. 3 mile loop, overall elevation gain 500 feet (only about a 200 feet gain per mile). Trail Head/Parking – Day use parking area at Piso Picacho Campground. $8 day use fee, free parking if camping within park. Stonewall Mine Road –Easy – Paved, level road from the parking area, 2 Miles roundtrip. Trail Head/Parking – Stonewell Mine parking area. $8 day use fee. Juaquapin Trail – Easy – A scenic loop, climbing via the East Side Trail and Juaquapin Trail, with a steep return down via the Dyar Spring Trail. Opportunities for wildlife spotting, including both deer and birds, as well as seasonal wildflowers. 3 Mile total loop, and a total elevation gain of 400 feet. Trail Head/Parking – Sweetwater Crossing parking area, no fee. Stonewell Peak Trail –Moderate – The most popular trail in the park (and for good reason), this trail is a well graded path that winds it’s way 900 feet up to the top of Stonewell Peak. The last section is on an exposed ridge with steps and handrails (as you can see in the pictures below). The peak provides excellent views of the park in all directions. 4 Mile roundtrip. Trail Head/Parking – East side of Highway 79, directly across from the Piso Picacho campground entrance. Day use parking area at Piso Picacho Campground. $8 day use fee, free parking if camping within park. Trail Head/Parking – Campfire circle parking lot in the Green Valley Campground. $8 day use fee, free parking if camping within park. 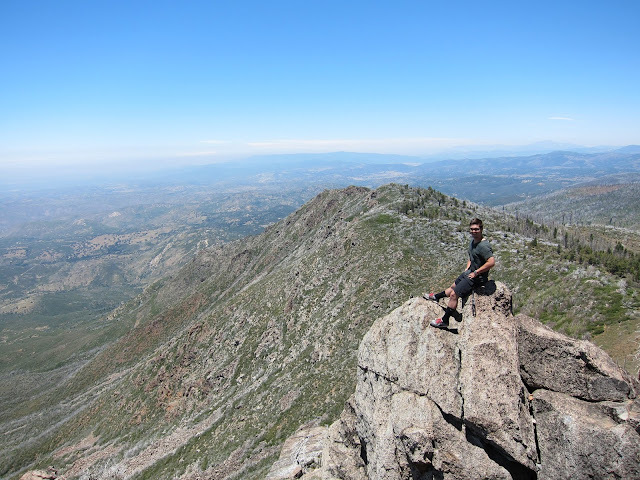 Cuyamaca Peak –Moderate/Difficult – The steady climb, and the overall elevation gain of 1700 feet, makes this trek difficult to the occasional hiker, but traveling on a paved road makes it easy on the feet. The view from the tallest peak in the park is well worth the trip. 7 miles roundtrip, although there is more than one way down if one chooses to extend their day. Leashed dogs are permitted. Trail Head/Parking – Make your way through the Piso Picacho campground to the top, where you will find the trailhead near the shower/bathroom facilites. 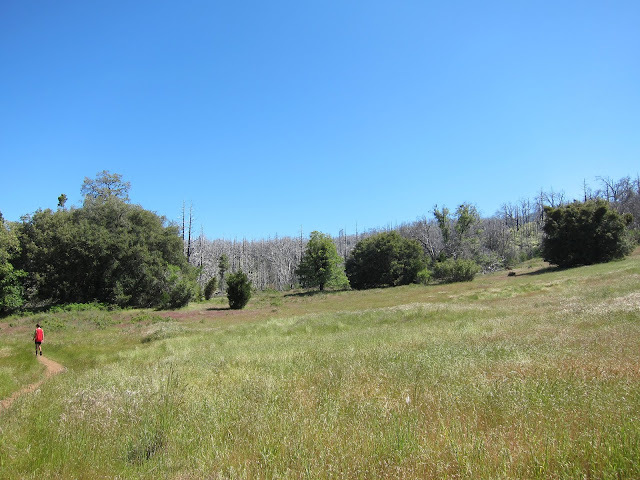 The road originates at the Cal Fire Station, so there is no shortcuts around the campsite. Make sure to enjoy the shade on your trip from your car to the trailhead, it’s the last you’ll get until a stretch at the very top! Use the day use parking area at the Piso Picacho Campground. $8 day use fee, and free parking if camping within the park. Oakzanita Peak – Difficult – A long, steady climb to the top of Oakzanita Peak via the East Mesa Fire Road and Oakzanita Trail. 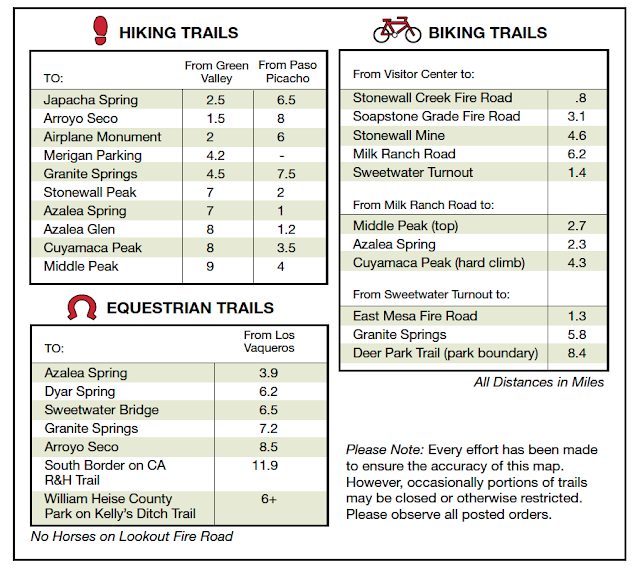 You can return the same way, or take a steeper but more direct route down the Uper Descanso Creek Trail. The trails have little shade and are hot in the summer, but the beautiful views are worth the effort. 8 Miles total, with an elevation gain of 1300 feet. Trail Head/Parking – East Mesa Parking area, no fee. Although we know you already know this, we also are going to include the Hiking Safety/Etiquette portion of the hiking guide. Be considerate and be safe. Don’t be deceived by the numbers we just listed, a 500 foot elevation gain can be considerable on a hot day, especially since you’re already at 5,000 feet above sea level. Most importantly, don’t skimp on water! 1) Never leave without plenty of food and water. You need 1 gallon per day per person minimum. 2) Hike with a partner. 3) Hike by the clock, not by miles. Allow plenty of time to return to your destination before dark. 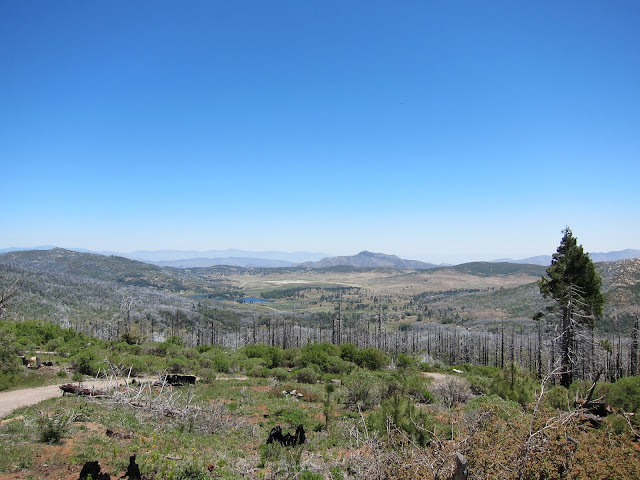 Cuyamaca is a stellar park, and the camping and hiking opportunities are really second to none. I would have to say that Lake Cuyamaca is one of the top 3 state parks that I’ve been to. Make sure you make your reservations in advance – word has got out about this place (ask anyone who is interested in the outdoors in So Cal and they’ll likely tell you about when their next visit to Cuyamaca is scheduled). Find more information and make reservations here. Thanks for the great review and information! A group of us are staying at Green Valley in a couple weeks. None of us have ever visited the area let alone camped there. I heard there was a waterfall but I was afraid it was perhaps only seasonal like spring. Glad to hear otherwise. Really looking forward to the trip now! Also looking forward to yours review of Paso Picacho, was so torn between which to stay at. This is great information, I’m so glad you took the time to review this campground. We are heading to Green Valley in two weeks with our 3.5 year old for the first time…wish us luck! Thanks for the info. We just booked a trip for the end of July. Very helpful information!